HERMAN M. VAN PRAAG, M.D., PH.D.
Apart from his scientific accomplishments, Professor van Praag's influence has extended far beyond science itself. He has motivated hundreds of researchers in the whole of Europe, Israel and the United States to venture into the field of biological psychiatry and neuropsycho-pharmacology. 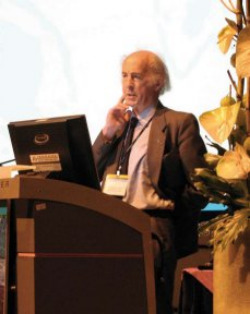 Not only has he inspired them, he has in fact founded several national and international organizations in the field of biological psychiatry. Finally, Professor van Praag has shown considerable personal and scientific courage, withstanding multiple personal and scientific assaults in the seventies, initiated by the anti psychiatry movement in Europe. During these unwarranted and unfounded attacks against psychiatric research, and biological studies in particular, he has held fast to his scientific and humanistic ideals, continuing as he did in his quest to find the biological underpinnings of abnormal behaviour.